D80/Blueboxx with dome port and dual strobes. Wide-angle lenses should be used behind a dome port to maintain the angle of view and corner sharpness. The optics of a dome port is only working under water, and therefore cannot be tested outside the water. Basically, the dome produces a virtual image on which the camera is focusing. As smaller the dome, as closer this image moves towards the lens. That means that only lenses able to focus at the virtual image within the dome port can be used directly. This requires lenses with very short focusing distances. Otherwise, a close-up diopter has to be mounted in front of the lens. Sharp images (especially in the corners) can only be obtained if the dome is large enough and the lens is able to focus close enough. In many cases the image quality can be improved by a diopter, however, with the diopter focus at infinity might not be possible any more. 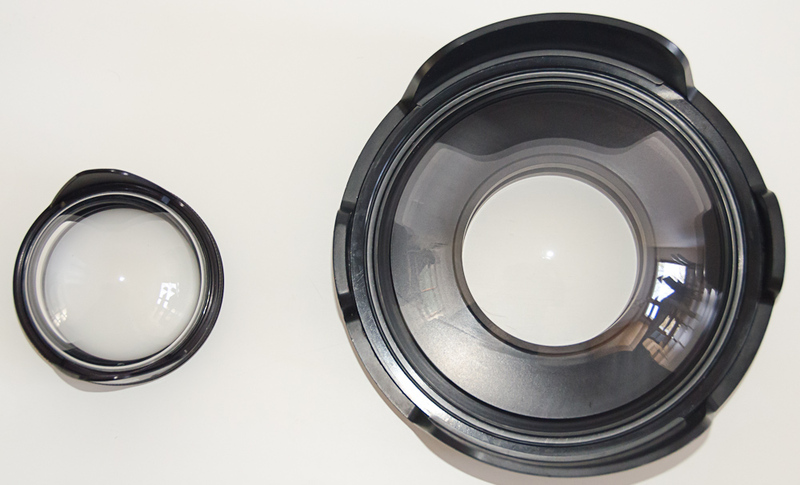 Direct comparison of 4'' and 8'' dome ports. The Ikelite 8'' is made of acrylic glass that reduces the weight and the price of the port considerably, without compromising the optical quality. 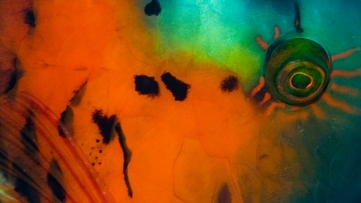 The refraction index of acrylic glass is close to that of water, so that small scratches are not noticeable underwater and don't show up in the pictures. The material is softer than glass, and thus more easily scratched. However, these scratches can be easily polished away, whereas a glass dome with a scratch is ruined. With the 8'' dome, both fisheye and rectilinear wide-angle lenses can be used, and the ability to focus very close is less critical than with smaller dome ports. The Aquatica 4'' Mini Dome is exclusively usable for very close focusing fisheye lenses, in particular the Tokina 10-17. It is not usable for normal rectilinear wide-angle lenses, since these lenses don't focus close enough and even with diopters attached will have problems with corner sharpness. The Mini Dome is made of glass with optical anti-reflection and scratch resistant coating. The direct comparison shows just how much smaller the 4'' dome port is compared to the 8''. Despite being made of glass it weights much less and can be much more easily packed in carry-on luggage. Due to its smaller size it allows you to get closer to the objects and thus to get close-up wide-angle shots. The downside is that half and half shots are not possible due to the small size of the dome. 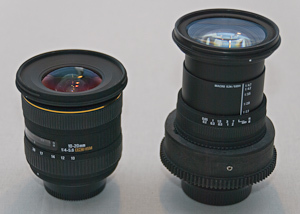 Wide-angle lenses: Sigma 10-20 mm, Sigma 17-70 mm extended and with zoom ring. For wide angle photography the Sigma 10–20 mm wide angle zoom lens is a good choice. 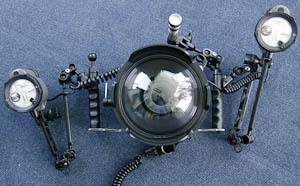 To cover the wide angle, two strobes such as the Inon Z-240 strobes should be used. I was quite pleased with the performance of this lens/port combination, especially with the corner sharpness. Behind the dome port the whole zoom range of this lens (17 - 70 mm) can be used. 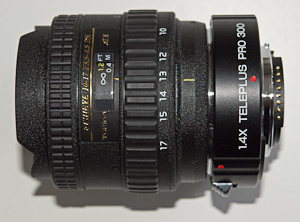 Since this lens extends much more than the Sigma 10 - 20 mm, a port extender has to be used. Behind the dome port the close focus of this lens is a big advantage since it can be used without an additional diopter. Behind a flat port the 17 - 70 is useful for fish photography and intermediate size objects. It is not (despite the name) a real macro lens since the maximum image size is 1:2.7 and not 1:1 as with true macro lenses. The flat port results in strong vignetting at focal lengths below 30 mm, and thus seriously limits the wide angle range of this lens/port combination. Although the 17 - 70 is useful for underwater photography, it is a compromise at both the wide-angle and macro side. I prefer the Sigma 10 - 20 mm for wide-angle and the Nikkor 60 mm for fish photography. Mini Dome with extension ring (left) to fit the Tokina 10-17 fisheye lens with TC (right). 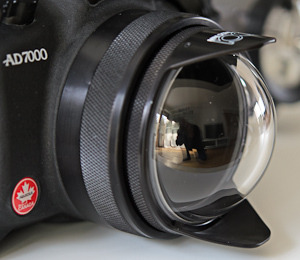 This is the only zoom fisheye lens on the market (in 2012) and a big success among underwater photographers. It is a DX lens, which means it will show strong vignetting with a FX camera. Fisheye lenses show an extreme, characteristic distortion and a wider filed of view compared to normal, rectilinear wide-angle lenses. For underwater photography this is in most cases no problem, since there are view straight lines in blue water. A big advantage of the combination of the Tokina 10-17 mm with a Mini Dome is the ability to do close-up wide-angle photography. The small dome and short focussing distance allows you to get very close to an object while simultaneously showing part of he landscape. This works even better with the Kenko 1.4 x teleconverter. This combination corresponds to an effective focal lengths of 14 - 24 mm, which gives more magnification for small objects in the close range.